The season opening IAAF Diamond League opener in Doha certainly lived up to the hype as the action was tremendous. Opening day did not disappoint. Justin Gatlin ran a PR and the second-fastest time in history before August (and it’s only May) at 9.74 to win the men’s 100, two guys (Christian Taylor and Pedro Pichardo) for the first time in history went over 18 meters in the same triple jump competition and men’s distance running suddenly became a lot more interesting as Mo Farah, who had started the season looking invincible with a world record in the indoor two-mile and European record in the half marathon, was beaten in the men’s 3,000. We recap it all for you below, starting with the mid-d action. Our recap of the men’s 3,000 got its own article: Ethiopian Hagos Gebrhiwet Takes Down Mo Farah In Doha 3,000 . 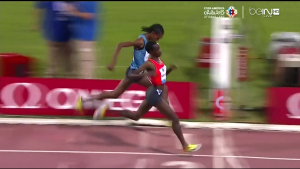 Reigning world junior champ Dawit Seyaum of Ethiopia picked up the first Diamond League win of her career as she bested reigning European champ Sifan Hassan of the Netherlands, 4:00.96 to 4:01.40. Reigning world champ Abeba Aregawi was a total non-factor and just 7th in 4:04.42. 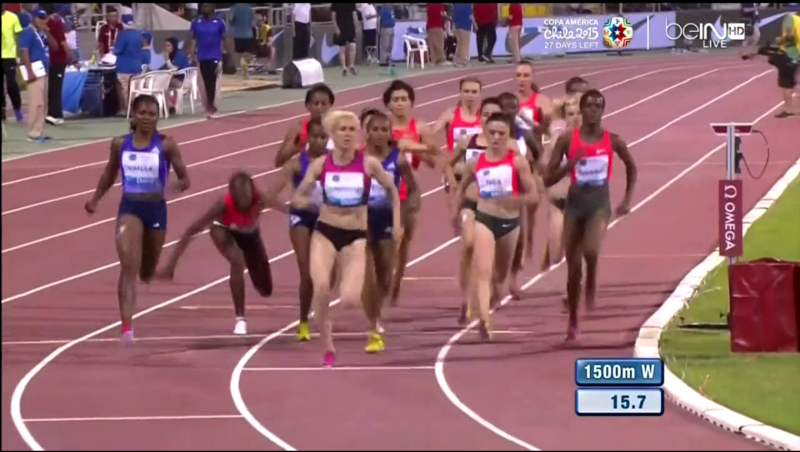 Aregawi almost fell 100 meters into this one but this isn’t the reason why she lost. There was the potential for a really fast time in this one as the rabbits were prescribed a pace of 62 seconds for the first 400 and 2:06 for the first 800. That didn’t happen, however, as the two big guns, Sifan Hassan and Abeba Aregawi, weren’t factors early. Hassan, as she likes to do, went to the back immediately while Aregawi stumbled 100 meters into the race (though she didn’t go down) and settled into the middle of the pack. 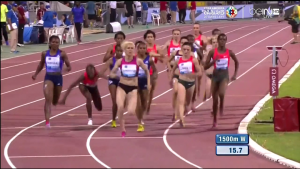 The rabbits came through 400 in 63.36 with an eight-meter gap to Luiza Gega of Albania, who in turn had a gap of a few meters on the rest of the field. It slowed down on lap 2 as the rabbits came through in 2:09.36 (66 lap). At that point, Hassan had gone to the front, leading the chasers through in around 2:11 ahead of Dawit Seyaum and Aregawi. With 500 to go, Hassan began her long drive for home but the pace remained moderate as the third lap was just 65.39. Things picked up on the backstretch as Hassan, Seyaum and Axumawit Embaye began to separate from the field. 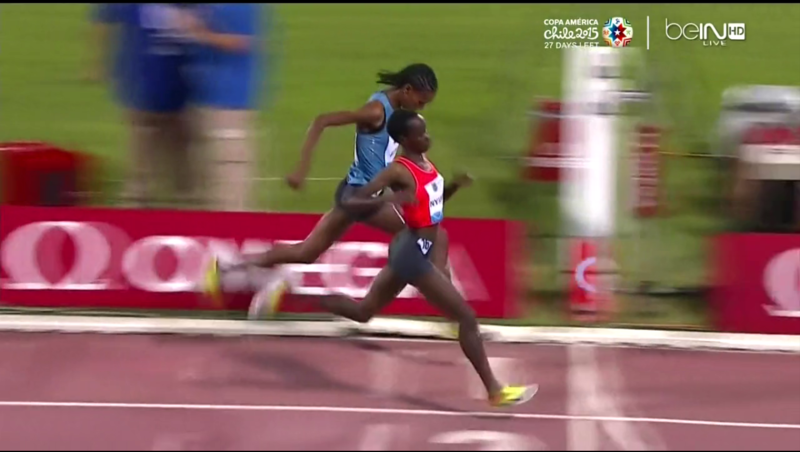 Seyaum moved up into second on the final turn and from 100 to 25 meters to go, she and Hassan ran stride for stride. 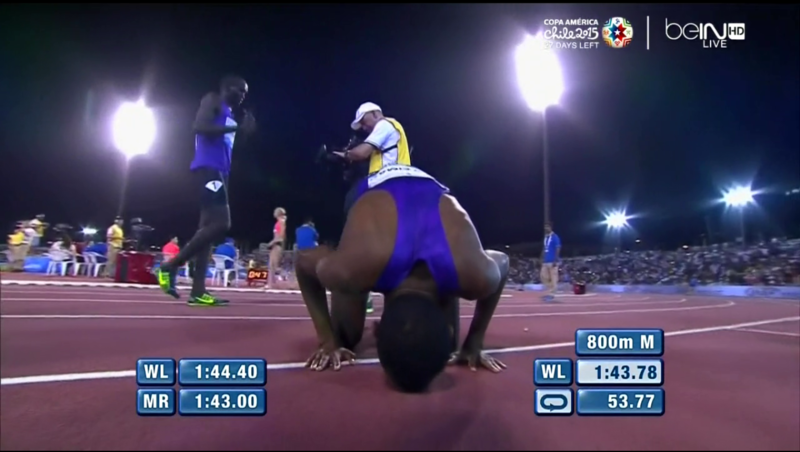 Neither athlete was giving an inch, but in the end it was Seyaum, the 2014 World Junior champ, who pulled away, taking the win in a world-leading 4:00.96 with Hassan forced to settle for second. In our meet preview, we suggested that Seyaum, 18, could blossom into a star this year, and she started her 2015 Diamond League season in the best possible fashion with a big win today after a strong last lap (61.99 leader-to-leader but she was closer to 61-flat as she wasn’t in the lead). Hassan was the world leader last year and for Seyaum to outkick her in the DL opener is a great sign. In the past, when Aregawi has been at her best and Jenny Simpson at hers, Aregawi has been just a little bit better. It’s clear after this one that Aregawi is far from in good form as she looked ordinary on the last lap, after not running aggressively as she has in the past early on. In the past, she’s run really fast, maybe too fast early. We were wondering if this year if she was opening up later this year to try to get her peak right but this race might show she opened up later than normal as she’s had a hiccup in her preparation as she didn’t look good. Reigning world indoor 1,500 champ Ayanleh Souleiman of Djibouti, who recently became just the third man in history to join the sub-13:20/sub-1:44 crowd, was way better than everyone else in the men’s 800 as he won in a world leading 1:43.78. Reigning outdoor world champs Mo Aman (9th 1:47.38) and Asbel Kiprop (5th, 1:45.11) looked ordinary in this one. It took a little while for rabbit Bram Som to get the lead as with several runners forced to share a lane, everyone was going very hard off the start line. Once he did, the pace slowed over the next 200 and at 400 he led the field through in 50.01. Behind him, Musaeb Abdulrahman Balla, Asbel Kiprop, Jeremiah Mutai and Ayanleh Souleiman led a bunched field. Once Sum dropped out, Kiprop held onto the lead and at 600 meters (1:17.60), he had the lead though Souleiman was moving up quickly. Souleiman made the pass on the final turn and he started to form a small gap over 2014 World Junior champ Alfred Kipketer, who had moved past Kiprop into second. On the home stretch, it was all Souleiman; no one could touch him as he ran to a world-leading 1:43.78 – the first sub-1:44 in the world this year. Ferguson Rotich Cheruiyot won the battle for second (1:44.53) as he rolled up most of the field by riding the rail in lane 1. Defending world indoor/outdoor champ Mo Aman didn’t look like himself in this one as he was toward the back of the pack for most of the race and was never a factor when the kicking began. He wound up second-to-last in 1:47.38. The winning time was 1:44.49 last year by Aman with Nijel Amos second in 1:44.54. Aman and Amos went on to record the fastest and third-fastest times of 2014 later in the year (1:42.45 for Amos, 1:42.83 for Aman). Souleiman’s 1:43.78 was just .15 of a second off his PR and just .02 of a second off what he ran to earn bronze at Worlds two years ago. Only three men in history have broken 1:44 and 13:20, but August 21, 1988. Souleiman has now done both in a three-week span (13:17 and 1:43). Two weeks ago at World Relays, Rotich went out in a ridiculous 47.84 on the 800 leg of the DMR and split a 1:44.49. Today, he ran an almost identical time (1:44.53) but ran much more even splits as he moved from ninth to second over the final 100 meters, mowing down most of the field on the inside. Rotich’s tactics were definitely better today, but he also benefited from the fact that no one in the field was running on the inside of lane 1 on the homestretch. We’ve written time and again that runners should never give up lane 1 on the home stretch unless they need to go wide to pass and in this case several runners allowed Rotich to move through. Alfred Kipketer, who got third, only has himself to blame as he left Rotich a gap and Rotich responded by beating him by .06 of a second. Aman joined the Mark Rowland-coached Oregon Track Club Elite in Eugene this year and we were anxious to see how he would adapt to the U.S. lifestyle and Eugene’s top-notch training environment. One race isn’t enough to render a verdict, but this one was not promising at all for Aman. He never ran near the front and had nothing in the final 100 as he ran just 1:47.38, his slowest time in a non-championship race since February 2011 (and that was indoors). Prior to today, Aman had finished outside the top two in just two of his 15 career Diamond League 800s. You might want to lean next time. In one of the biggest upsets in Diamond League history, Kenya’s 21-year-old Virginia Nyambura – the rabbit in the race – stayed in the race and took down the victory in a world-leading 9:21.51 in a race that was run in 99-degree heat. She just edged Hiwot Ayalew of Ethiopia, who was second in 9:21.54 with Hyvin Kiyeng of Kenya third in 9:22.11. American Aisha Praught was 11th in 9:40.48, missing her PR by .05 seconds. Nyambura rabbited for 2k before moving out and jumping back in the back in 5th. She was still 5th at the bell. 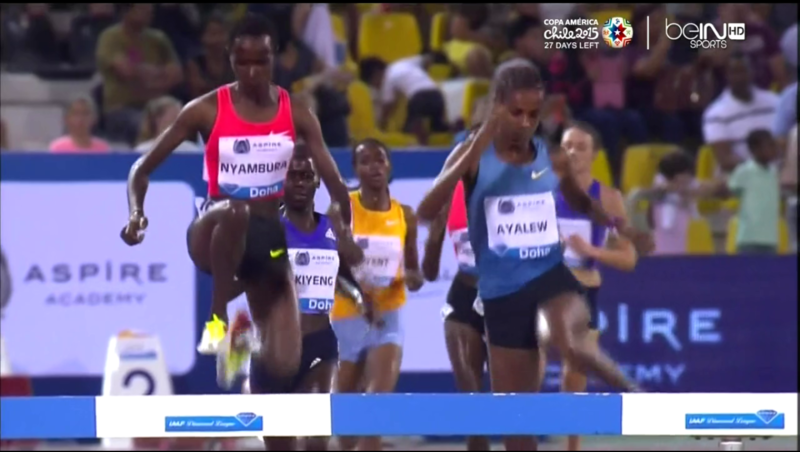 On the backstretch, Ayalew opened up a 4-5 meter gap on the chasers but Nyambura bridged that gap by 200 to go. After the final water jump, Nyambura made her bid for glory. She just edged ahead before the last water jump and held on for a tiny victory although weirdly she didn’t lean. 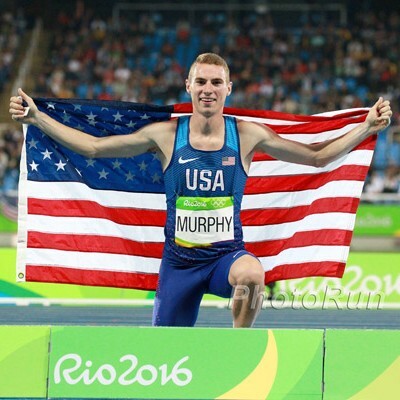 Quick Take #1: This was an ironic result given what happened in last year’s DL steeple opener. In the first women’s DL steeple of 2014, Emma Coburn got the win after some of her competitors let her go, thinking she was the rabbit. This time, in the first DL steeple of 2015, the rabbit actually did get the win. 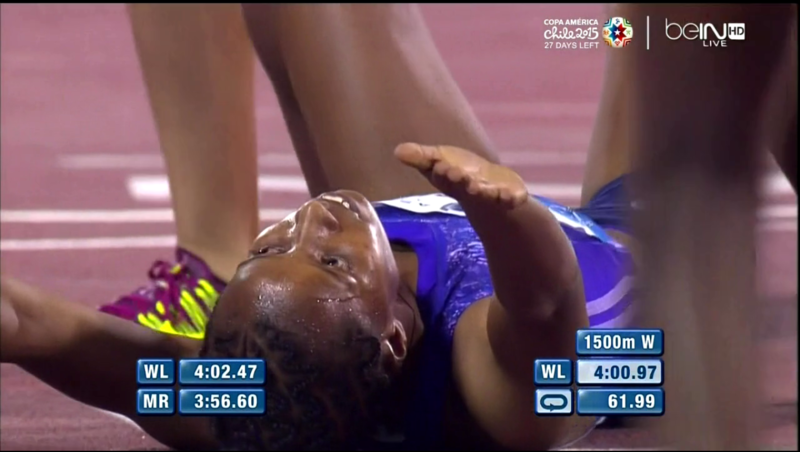 Quick Take #2: Virginia Nyambura had broken 10:00 twice in her life prior to tonight. Nyambura, who rabbitted three DL events last year and six in total, had a PR before this race of 9:58.08 from Brussels in 2013. She ran 9:59.06 in Ostrava earlier that year and that was the sum total of her career sub-10:00s before her 9:21.51 clocking today, a 36+-second PR. 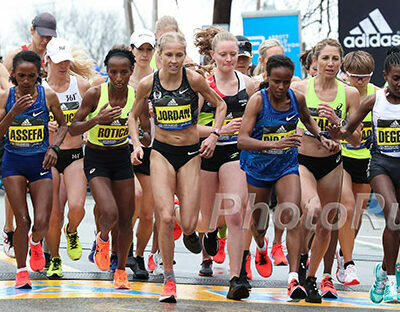 Though big PRs are more common in the steeple than other events, this kind of breakthrough is almost unheard of. Nyambura is only 21 and it’s not rare for 21-year-olds to register big PRs. 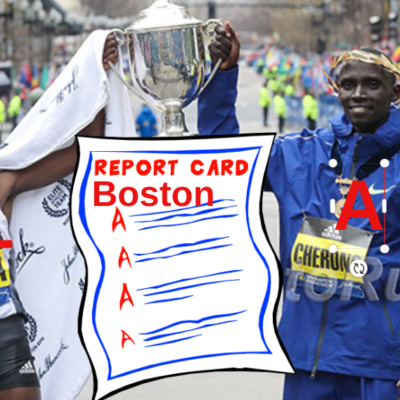 But a 30+ second PR is ridiculous, especially when you consider Nyambura had been racing in Europe for three years now. Admittedly, Nyambura didn’t finish any DL events last year so she wasn’t taking on the top competition, but she only ran 10:02.18 (finishing 6th) and 10:06.45 (finishing 10th) in the two steeples she did finish last year. Nothing suggested this kind of breakthrough. 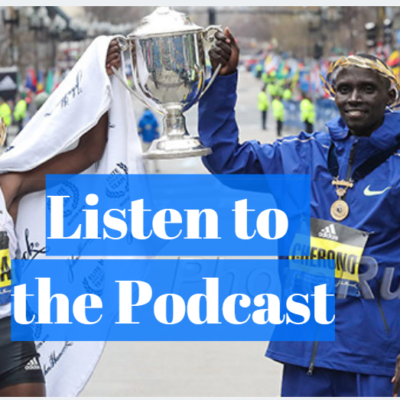 Quick Take #3: The beauty of running: Virginia Nyambura is now a world title contender. Nyambura wasn’t on anyone’s radar, but after holding off the world’s top steepler last year, Hiwot Ayalew, she has to be considered a medal threat at Worlds later this summer. When a 14-seed pulls an upset in the NCAA tournament, no one thinks of them as a title contender based on that one result. Similarly, if the Jaguars beat the Patriots in the NFL this year, no one is going to start calling them a Super Bowl contender. But in running, times don’t lie. Nyambura doesn’t automatically become the favorite, but if you can run 9:21 in 99-degree heat and beat the world’s best, you belong in the championship discussion. Quick Take #4: Don’t tell us steeple form is important. Nyambura is on the left. Justin Gatlin streaked to a huge 9.74 victory, a personal best and even faster than he ran before he served his doping suspension from 2006 to 2010. Only four men in history have run faster – Usain Bolt (9.58), Tyson Gay (9.69), Yohan Blake (9.69) and Asafa Powell (9.72). Gatlin’s time shaved a full tenth of a second off of Powell’s world leader from last week and is the fastest time in the world since Blake’s 9.69 in Lausanne on August 23, 2012. It’s also the second-fastest time in history that has been run before August – only Usain Bolt’s 9.72 world record in New York in May 2008 is faster. Talk about this one on the message board: Justin Gatlin 9.74 letting up – Are you kidding me? This one was a real treat. 21-year-old Cuban Pedro Pablo Pichardo, the 2012 world junior champ and 2013 world silver medalist, became just the 4th man in history to jump over 18.00 meters as he jumped 18.06 in the third round. But get this. He almost lost the competition. In the sixth round, Olympic champ Christian Taylor became the fifth man over 18.00 as he jumped 18.04. It seems like every year another American woman breaks out in the 100 hurdles and this year’s star is Jasmin Stowers. She signaled her arrival with a wind-aided 12.54 in her season opener on April 18 and has gotten faster each time out, running 12.40 at Drake on April 25, 12.39 in Kingston last weekend and a Diamond League record 12.35 today in Doha. Yes, that’s right. She set a Diamond League record in her first-ever Diamond League meet. That’s the fastest time since Brianna Rollins’ 12.26 American record at USAs in 2013 and puts Stowers #7 on the all-time list. Stowers, an LSU grad, is still only 23. If she can run 12.35 in May, how fast can she go later this summer? The 2014 NCAA runner-up came into the year with a 12.71 PR (12.54 windy) but she did run 12.88 as a freshman in 2011. The U.S.’s Bershawn Jackson unleashed a blazing final 200 meters to destroy the field in this one, running a world-leading 48.09 to take the win over Puerto Rico’s Javier Culson. Crazy fact – Jackson has run sub-49 for 13 straight years. Defending U.S. champ Francena McCorory pulled away from Sanya Richards-Ross over the final 100 to get a nice win in 50.21 seconds. She’s now beaten Richards-Ross commandingly in two of their last three races (she beat her 50.13 to 51.09 at Drake on April 25 and lost to her, 49.95 to 50.73, last week in Kingston). Richards-Ross had the lead early but had nothing left in the last 100. The U.S.’s Tianna Bartoletta almost cracked seven meters but had to settle for the victory and a world lead of 6.99. After Olympic champ/WR holder Renaud Lavillenie‘s withdrawal, Greece’s Konstantinos Filippidis got the win with a vault of 5.75 meters. Two-time defending world champ David Storl of Germany got the win here, throwing 21.51 meters on his second throw of the competition. Olympic champ Sandra Perkovic took the win with a heave of 68.10 meters.